Interesting things have been happening lately concerning cults in Russia. Gerald Armstrong recently visited Moscow. He is very well known, if not a legend, in certain circles. However, to understand who he is and why his visit is so important, we must begin not with him, but with the teachings of Dianetics and Scientology, with Lafayette Ronald Hubbard, and why the Scientology cult is called a totalitarian and destructive sect on reference websites such as “Religions and Sects in Russia Today” by the Novosibirsk Center for Apologetics Research and Alexander L. Dvorkin’s “Sectarian Studies: Totalitarian Sects”. The Scientology cult has been operating in Russia since the 1990s. It is essentially a network of ramified organizations which offer techniques to become no more, no less than a superhuman, or an “Operating Thetan” (OT). Of course, this is not for free. According to reference materials published by the St. Irenaeus of Lyon Center, the method for becoming a superman devised by Hubbard (the founder of Scientology) is based on telling the organization every detail about oneself, even the most intimate ones. A closer look at the information on “Sectarian Studies: Totalitarian Sects” shows that the cult has its own intelligence gathering structures and that the goal of this organization is money and power. Moreover, this power should preferably be worldwide and total. Duration: 2 hours 11 min. 57 sec. Alexander Dvorkin (AD): I’ll translate from here. 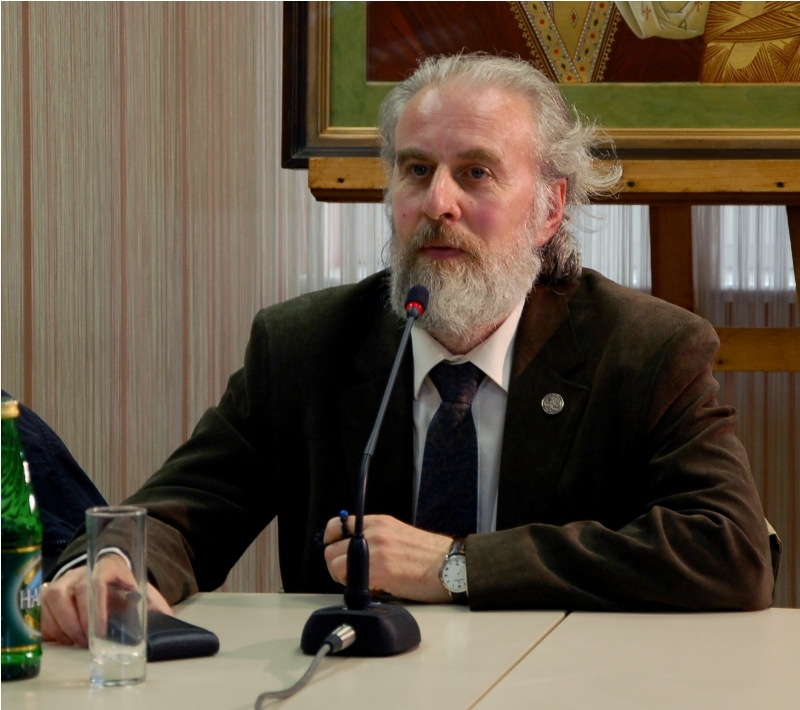 Gerry Armstrong, former personal secretary to Ron Hubbard, founder of the “Church of Scientology”, spoke at St. Tikhon’s Orthodox University on May 18 at 7 P.M. The meeting was attended by university teachers and associates and by numerous guests. The hall was filled to capacity and the meeting lasted two hours. 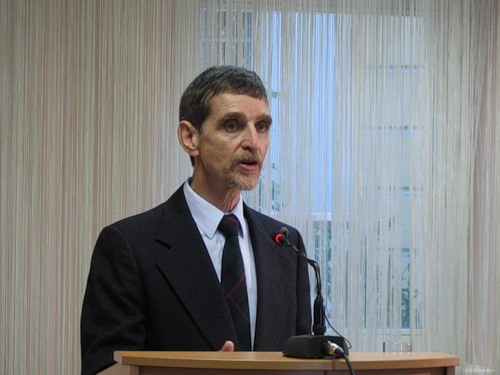 During his talk, Gerry Armstrong spoke about the history of the “Church of Scientology “, one of the most dangerous cults in the world today, and about his work in this organization, his personal impressions of his encounters with Hubbard, the contents of Hubbard’s personal documents, his escape from the totalitarian organization, and his subsequent fight against it. Gerry Armstrong answered many questions from the audience. He spoke about the danger that the sect poses for private individuals and for society as a whole. 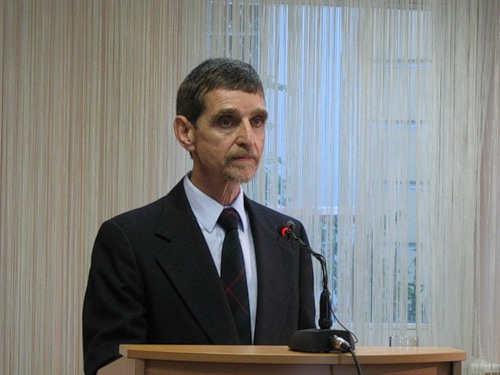 In particular, he explained how cooperation began between the cult and the U.S. government in 1993 and how security services, as well as then U.S. President Bill Clinton and his Secretary of State Madeleine Albright, were involved in taking the decision regarding this cooperation..
Gerry Armstrong will meet on May 19 with officials of the Russian Ministry of Justice to provide information for combatting the spread of this destructive organization in Russia.